Asset searching can be helpful in debt collections. Before becoming involved in a financial or personal commitment, getting an asset search conducted can ensure utter peace of mind and can prevent future hassles in case things go sour. Thus, those who are having doubts about their soon to be financial or life partner should consider hiring a professional agency to conduct an asset search as this will clear all suspicions. An asset search is an investigation service where individuals get to hire an asset search firm to locate the asset of another individual or business. Apart from locating someone’s assets, even the aliases, corporate names and all other names the individual might be doing business with, can also be uncovered with the help of a competent asset search firm. After uncovering these names, bank accounts, credit, PayPal accounts, property, real estate holdings and also trust accounts of the individual are investigated. Information such as this can prove to be rather crucial for those trying to collection money, getting into a financial or personal commitment and getting such asset search or investigation conducted will help people avoid future legal issues. Hiring an asset searching firm can become necessary under several different circumstances. Business trials can turn out to be quite costly. Lenders who have lent money often need to sue their debtor when they are not being repaid. However, debtors might often pose that they do not have the resources to pay back the debt and the lenders end up spend even more money in the process of collecting the repayment. Thus, getting an asset search conducted can help lenders become aware of all hidden assets of a borrower and whether or not they will be capable of repaying the debt in the future. Asset searching can also prove to be helpful in cases involving child support, where one of the spouses is refusing financially support their child when the court ruled custody in favor of their ex-partner. In cases like these, one of spouses will plead that they do not have the means to support their child; however, whether or not their claims are authentic can be verified with an asset search. Going through a divorce means enduring quite a lot of stress. While a situation like this can be quite emotionally disturbing, however, the financial stress involved in the utterly drastic. When it comes to the final divorce settlement, weary partners want to pay as less as possible and they might try to hide their assets in such situations. Thus, those who feel that their ex-partner is hiding their assets from them and they are not getting their fair share from the divorce settlement can also hire an asset search firm to investigate their ex’s assets. 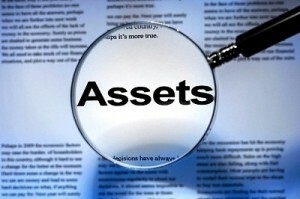 Asset search firms can also be hired in cases involved judgment recovery and private will disputes as well. Both business and private partners can try to be discrete about their assets and those who suspect their partner is doing the same can consider going forth with asset searching by hiring an asset search firm.